The setting sun casts a warm rosy tint over Rangitoto Island. The tall office towers sparkle and glisten. Workers pour into the Wynyard Quarter for a pint, or two. The happy bustling atmosphere is infectious. This is Auckland, or Tāmaki Makaurau, often rated by many travel organisations and publications as one of the best cities in the world to visit. If tourists love the adrenalin and physical drama of Queenstown they will love so much of what cosmopolitan Auckland has to offer: Conquering Auckland’s Sky Tower which has a sheer 192-metre drop on either side, blokarting (yes, blokarting) beside rolling surf on Muriwai Beach – which is not going to be covered into a port in the next 200 years; canyoning in thick bush on Auckland’s west coast, bunging jumping off the harbour bridge; or kayaking to Rangitoto at twilight. We sensibly did none of those things but instead started our trip at Auckland airport to get our GO Rentals fizz car, GO Rentals is run by a top operator James Dalglish who started out washing cars 17 years ago, and is now GM of the major rental car firm which is going places. The friendly Go Rentals staff collected us from the terminal (which was very welcomed due to an unfortunately timed deluge of rain) and they sent us confidently on our way to experience the active streets of Auckland. We flit into the city, down Nelson Street and on to Victoria Park West to our Swiss-Belsuites apartment, overlooking the bustling, leafy Victoria Park by the heart of the central business district. We had a stunning view overlooking the park, Ponsonby and the harbour bridge. The space, quality and ambience of the new apartments was outstanding. We were impressed by all the modern comforts, especially the dedicated router in the apartment which provided super quick free wifi. This is a new concept of accommodation. It doesn’t have any room service, or bar or restaurant – but everything anyone needs is on their doorstep. It’s just a shame the Victoria Park markets have lost their appeal. We sipped champagne on our deck outside as the sun set slowly over the main drag on Ponsonby hill. The next morning, we strolled through the CBD and down to the marina which is filled with so many cool, busy restaurant and bars. It has a much better feel than Sydney’s Circular Quay and more appealing than Darling Harbour. Then the North Shore beckoned. We were in heaven at a quiet little Takapuna restaurant nibbling on divine Mexican food, washed down with lashings of white cola. We tootled back over the bridge to Sylvia Park for some serious shopping and fell in love with H & M, the new UK department store. Shopping bags in our arms we returned to our slice of paradise, our lovely apartment, and refreshed headed to the Marvel restaurant for the best snapper and chips – ever. We loved ambling along the viaduct and the waterfront crammed with luxury yachts as we soaked up the homogenous architecture with its patchwork of styles: colonial, modern, gaudy, shabby, chic and resolutely downright -fashioned. But Auckland is a city on the move, make no mistake about that. There’s more building work going on than in Christchurch which is plodding along with its rebuild since the 2011 earthquake. 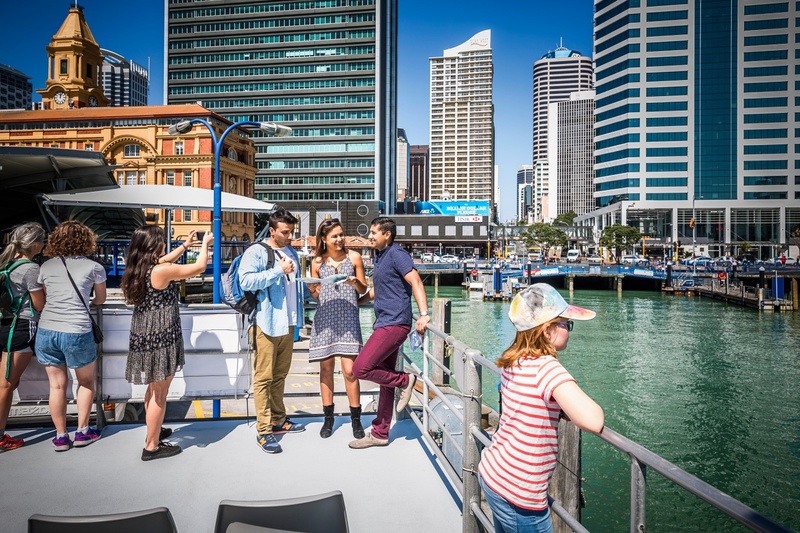 Auckland has really come of age as a sophisticated and truly international city that is being recognised and endorsed by all who sail from her. Also see NZ Business Traveller.